Linda Cruickshank, Vision Support Officer, RNIB Scotland offers handy tips for occupational therapists to create a safe environment for people with a learning disability and sight loss. 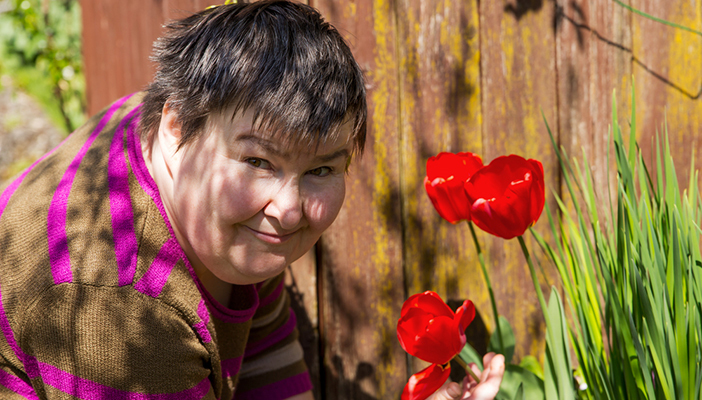 Over 95,000 people in the UK are estimated to have a learning disability and either blind or partially sighted. Supporting someone with a dual diagnosis can be challenging and often behaviours that are thought to be associated with a learning disability are actually associated with sight loss. UK Vision Strategy 2013 outlined that early detection of sight loss, prevention, treatment and rehabilitation can positively influence independent living skills, communication and social skills. Occupational therapists can play a pivotal role in ensuring people with a learning disability and sight loss by helping to create a safe living environment, promote independence and maximise use of vision, where possible. Maximise use of natural light where possible. Use vertical blinds to help control adverse effects of natural lighting such as glare and shadows. Artificial lighting levels should be consistent, even and controllable. Make things bigger, brighter, and bolder by using good colour contrast. Avoid highly patterned wallpaper, carpets and furnishings. Avoid reflective surfaces where possible to minimise glare. Encourage a clutter free environment to avoid potential hazards and trips. Use individual tactile signifiers to aid location. Use well contrasted and consistent pictorial and written signage. Offer guidance and support where appropriate.